The use of different devices to explore or surf the web is on the increase at a swift pace, but regrettably, much of the web is not fully optimized for these devices. Smartphones are often controlled by display size and have need of a dissimilar approach to how content is presented on the screen. 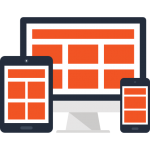 A massive amount of poles apart screen sizes subsist across these devices and with always changing the display, it’s key that your website can become accustomed to any of the screen size, now or in the near future with offshore outsourcing web design services. Responsive web design makes sure users have a better-viewing experience no matter what sort of device they are using. We design for the most excellent experience for all probable users with our responsive custom web design services. Your website pages will be explored or viewed using many diverse devices like desktops, smartphones and tablets. We make your web pages look remarkable and up to date, and be trouble-free to navigate, in spite of the device used to walk around them. Constructing different websites for each category of device purely wouldn’t be a great idea. So building supple and fluid layouts that become accustomed to almost any screen is the only viable solution. Even Google prioritize mobile-friendly websites in its all-inclusive search results algorithms, so it’s more vital to ensure your web portals is optimized for mobile by utilizing responsive design services. Our squad of analysts and designers works with you to convert ideas into significant user stories. We pass through a progressive course of action through an assortment of techniques to visualize a solution, first producing a skeleton of the solution that assists you to validate the initial concept before it is all set for web development.